Jane trying to stop Mrs Mangel telling Paul about Disclosure. Mrs Mangel ignores Jane's efforts and the result is that Paul now knows she was the one who gave the story to the magazine. Paul questions whether she had considered the effect on Susan Cole, himself, or the Daniels Corporation. Mrs Mangel tries to justify her actions by saying she was grievously wronged by Scott. Paul asks her to explain how she was justified. Mike is bringing in two cardboard boxes, one of which is marked, “Straws”. Daphne asks if he's been training and he says he has, and yes, it was at the public pool. Daphne is indignant that Mike has to pay to go there when Scott can train in the Ramsays Pool anytime. Enter Madge. MADGE (fraught): Drink, Daphne. Any kind. I've been pedalling that confounded bike. I don't know how I got roped into this race! DAPHNE (walking round the counter): At least it's not costing you money, Madge. MADGE: (looks very puzzled) What's that got to do with it? DAPHNE: Mike has to pay to train at the public pool while Scott gets to train at your place, Scott-free! MADGE: I don't know anything about that. MIKE: (embarrassed): Err, do you want me to start unpacking these? DAPHNE: This race is supposed to be a fun event, but everyone's so caught up! Anything for an advantage! MADGE: Including me, I suppose? MADGE: Well what about you? DAPHNE: Well what about me? MIKE: Daph, if you'll just tell me where to put these? 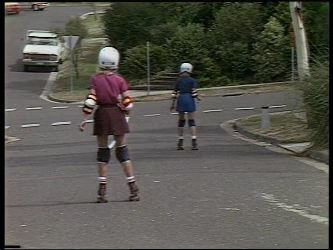 Charlene comes in through the back door on roller skates and crashes to a stop against the wall. She thinks he's doing the odds for the race, but he's working on this year's Melbourne Cup. Charlene sees the paperwork for the race and Henry has put Des's team with the better odds to win. She's surprised, but Henry justifies it by saying that Mike's a champion diver. Charlene says that's the point – he's a diver. Mike's a champion diver – Scott's the better swimmer. Henry says he's asked around and word is, Mike's the better in the pool, but he's tipped the Robinson team to win over all. Enter Scott, who's been in the pool. He's wearing a most becoming (!) green swim hat He says they will need to be careful as the baton is a bit slippery. He tries to explain to Charlene about the odds – that it isn't personal – then Madge walks in. 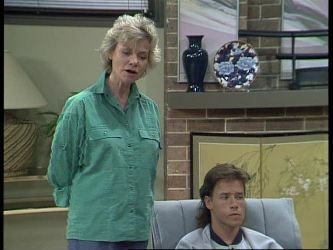 Henry calls on her to explain to Charlene, but Madge is adamant that none of the Clarke team have a hope, as they are going out there to win! An ecstatic Charlene gives her a bear hug. MRS MANGEL (now seated) : So that was the situation when Mr Morris approached me. Your younger brother had written cruel lies about me in the newspaper and I was most dreadfully upset. PAUL (getting to his feet): So you decided to get some revenge, is that it? MRS MANGEL: Of course not! PAUL: Didn't I give you a pay rise to cover that? (Leans towards her) Well? MRS MANGEL: Not then, you hadn't. Oh, I wasn't thinking straight. Then circumstances overtook me. I'm deeply sorry and ashamed. All I can do is ask you to forgive me. PAUL: And let you keep your job? MRS MANGEL: I'm efficient and most reliable, Mr Robinson. If you'll allow me one chance, I won't be found wanting. PAUL: No. It's not on, Mrs Mangel. Don't you realise that you could have put us all out of a job? You've committed the cardinal sin in business You've bitten the hand that feeds. I'm sorry, but you've given me no choice but to terminate your employment. Paul has just rung Gail to ask her to come in, and apologising for interrupting her weekend off, says he will explain when she gets there. Jane comes in, clutching a file and looking worried. She hands the file to Paul then says that as he has sacked her Nan, he should also sack her. She explains about the page from the Discovery file and Paul looks disappointed. He says he didn't think she would do something like that, and says that in such a cutthroat business, if he can't depend on his staff, he's sunk. He reprieves her, however, saying he doesn't think she would do such a thing again, but if she does, she will be out, no questions asked. He then packs her off to take part in the relay, which he doesn't have time to attend now, telling her that Gail is on her way in. He wishes her luck and then asks, rather shyly, if he was nay help with the roller skating. She says he was, and she will try extra hard to win. Harold comes in, pauses, then says that Jim and Des have asked him to act as judge for the big race and he's agreed. Mrs Mangel, with her back to him, tells him that she can't imagine anyone more suitable. 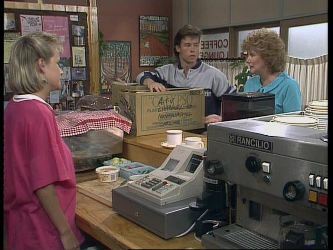 She is obviously upset and he asks if he can help, but Mrs Mangel tries to pass it off. She tells him that she has lost her job as she and Paul didn't see eye to eye on a subject. Harold is a little shocked, saying he has heard that Paul can be a bit of a rough customer. Mrs Mangel asks him not to talk about it but that Paul did have his reasons. She calls him Mr Bishop, and Harold says, “Harold, Please.” Mrs Mangel says that Mr Bishop will suffice, as they don't want the neighbours gossiping, do they. Harold is quick to agree. Jim is discussing the race, which is to start with the swimming. 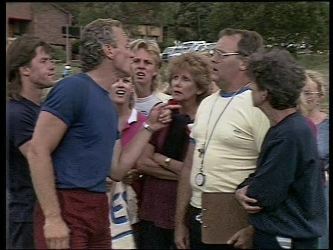 The boys are to take the batons from the side of the pool and hand them to the cyclists, who will do a set course. He's given a sheet of paper to Madge, who is looking at it every which way, trying to figure it out, till Jim tells her it's the map. The cyclists have to pass the batons to the skaters, who will skate to the entrance of The Oval where he and Des will be waiting for the batons. Charlene asks if they get to do a victory lap and with a slight laugh, Jim says he hopes so. He explains that Harold will be the judge, and then makes the point that it is supposed to be a friendly match, and win, lose or draw, that is what it should be. Madge snorts and says she doesn't think Mrs Mangel sees it that way. The TeamRobinson members each expresses their determination to win, Scott saying that it's time Mike, who thinks he is a champion swimmer is brought down to size. Also present, Harold Bishop, who is scrutinising something on a clipboard. Des is happy that the swimming is the first race as Mike is sure to win it and give them a tactical advantage going into the cycling. JANE: Well Nan's quite a good cyclist. She won heaps of prizes when she was a kid. DES (sotto voce): Whenever that was. 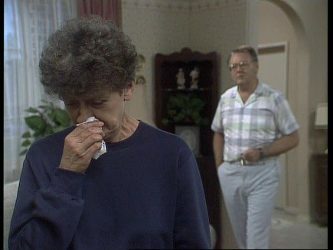 He notices that Mrs Mangel is Missing, and Harold explains that's why he is there – to explain that Mrs Mangel might not be able to compete due to personal problems. Des is not happy and asks how she is to be replaced, to which Daphne replies there isn't a problem as she can do it – and she doesn't need wrapping in cotton wool. Des is protesting as Mrs Mangel walks in wearing a navy track suit, apologising for being late. Harold begins to question her but she says she is looking forward to the race. Enter Helen, who hasn't, as suggested, come to spy, but to put forward some safety suggestions, which have already been put to the other team. Mrs Mangel and Madge are to wear cycling helmets while Jane and Charlene are to wear elbow and knee pads as well as head gear. Mrs Mangel and Jane agree with this and Helen concludes by saying that she is sure there will be no blood spilt. 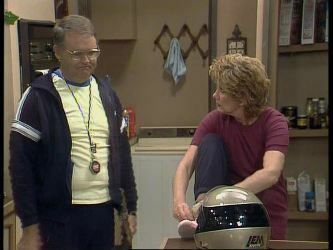 Madge is tying her shoe laces and Henry is calculating the bets when Charlene enters with two motorcycle helmets! Madge asks what happens if Mrs Mangel refuses to wear it. Charlene says she will be disqualified as she plonks the best of the two on Madge's head, to protests about not messing up Madge's hair. Madge spots what Henry is doing and is shocked about the amount of money he has taken on the race, and reiterates that she disapproves of gambling. Henry says it's her fault. All he intended to do was to run a small book for friends, but somehow the blokes at the Waterhole found out – now, how was that? Madge says she just mentioned it as a joke. Henry tells her the blokes don't think so and are all out the back ready to watch. 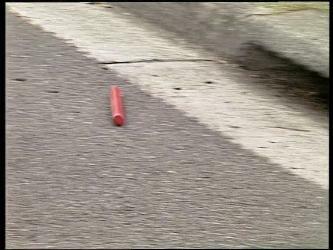 Harold comes in clutching two batons and mentions that there's a good crowd outside to watch the race. Madge is having problems being heard and tries to take off her helmet – with Charlene's help she succeeds. Madge thinks the helmets are a daft idea, but Harold says it was a good idea of Helen's. Madge asks how he knows it was Helen's idea, and he admits he was there at the team meeting, helping Mrs Mangel. They leave, then Scott and Charlene grab a kiss before following them. Mrs Mangel approaches Henry and asks if the betting is confidential. He says it is, and she puts on a $100 bet for her team t win. Henry is surprised, but she explains that she is in need of some money and she has complete faith in her team. She turns down the offer of a bet on the swimming, Henry books the bet and she moves away. Daphne and Jane are at the poolside to wish Mike luck. Des and Jim are at the Oval, warming up. Charlene takes the helmet to Mrs Mangel who declares that she won't wear such a monstrosity. Charlene says, she can always forfeit, and walks away, having won that round. Harold calls the swimmers to their marks. Scott is wearing goggles with flapping straps and that awesome green swim hat. Harold starts the race. It's neck and neck till half way when suddenly Scott's almost a length ahead and sustains the lead to win by a full length, handing the baton on to Madge. Henry walks away, very dejected. Two very wobbly cyclists set off as Jane and Charlene prepare for their skating. Henry admits he has a lot riding on the rest of the race as he's just lost a fortune on the swimming. Daphne tells Jane just to do her best, because Des will carry it off. Jane says it's putting a lot of pressure on Des, but Daphne says he can handle it. Gail is checking the paperwork for the convention as Paul frets and fusses behind her. She says that he picked a fine time to sack his housekeeper, and he says he wishes Mrs Mangel had kept her confessions till after the convention. Gail just wishes she knew the stock positions. Paul hands her a big file and says she can check things that way, and call the suppliers if necessary. 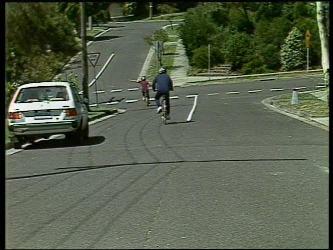 Mrs Mangel is first to turn into Ramsay Street and to take the hard slope up to the finish. Madge isn't far behind as the others yell encouragement, but it's Mrs Mangel who hands on the baton first. PAUL: Sounds like a woman after my own heart. GAIL: I'm not after anybody's heart. One disaster is enough for me. PAUL: Well, if we're to get this work done before the convention, we'd better get our skates on. The girls are skating together and somehow, Jane grabs Charlene's arm, Charlene drops the baton and it rolls down a drain. Charlene asks, “What now?” and Jane says just to keep going. She hands her baton to Des and Jim loses a precious minute asking where the baton is. Des sets off, but Harold tells Jim that he is disqualified – the rules say he must have a baton. An argument ensues while Des runs on, still wearing his full track suit, jacket flapping. Mrs Mangel asks Henry for her winnings, but he says the race hasn't been decided. There's a mix up. She says that the Robinson team has been disqualified, so she wants her winnings. Henry replies that there is no clear result so there won't be a payout. He tries to give her the money back, but she says she doesn't want that – she wants her winnings. Two random extras look on with mouths open as he walks away, with Mrs Mangle still protesting. She isn't the only one. Everyone else is arguing about the race when Des jogs up to Jim and asks if there's a problem..
JIM: Yes, I suppose you could say that. 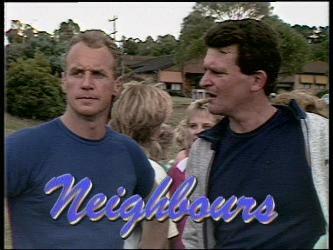 World War Three is about to break out in Ramsay Street.